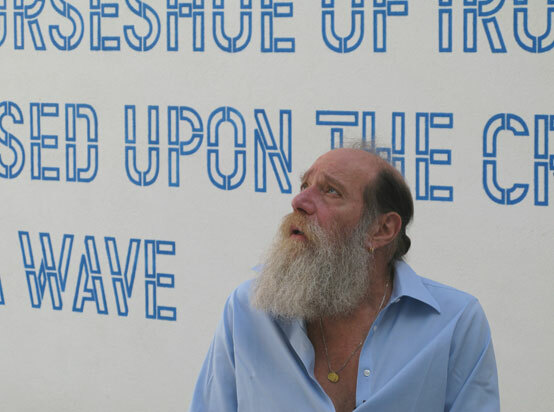 ‘THE CREST OF A WAVE’ by Lawrence Weiner was a project in four parts – a distributed ephemeral sculpture, a wall installation, a sound work and an action – together each asked what might constitute a public sculpture. Weiner's new work triggered a chronicle of Spain’s mercantile and maritime history, equestrian and commercial power, offering a biography of materials and a testament to the transmutability of language. 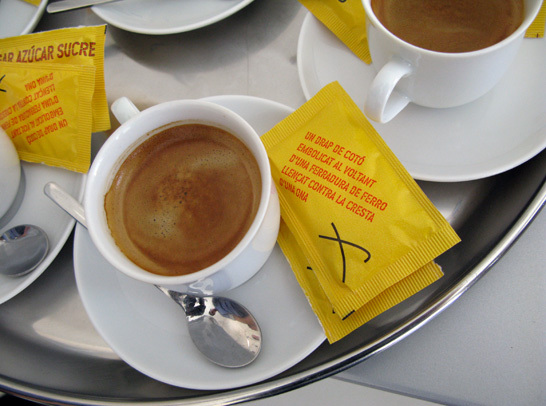 On the 24 September 2008, coinciding with the festivities of Mercè, the patron saint of Barcelona, an ephemeral sculpture by Weiner was distributed throughout over 70 emblematic bars, cafes and restaurants in the city to accompany café con leche, cortado, carajillo, or conversation. Printed on hundreds of thousands of standard 7 gram white sugar sachets in three languages, Weiner’s striking typographic rendition of the statement A CLOTH OF COTTON WRAPPED AROUND A HORSESHOE OF IRON TOSSED UPON THE CREST OF A WAVE, was accompanied by an emblem which evoked the trajectory of a certain horseshoe over a wave in diagrammatic form. 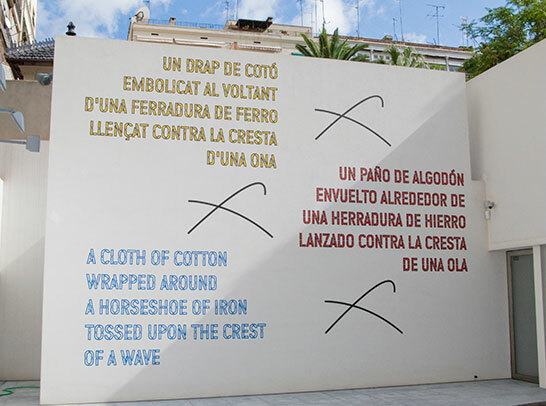 The second and third parts were exhibited at Nivell Zero at Fundació Suñol, where Weiner presented an adaptation of the statement painted on an exterior wall of the courtyard in Catalan, Spanish and English. 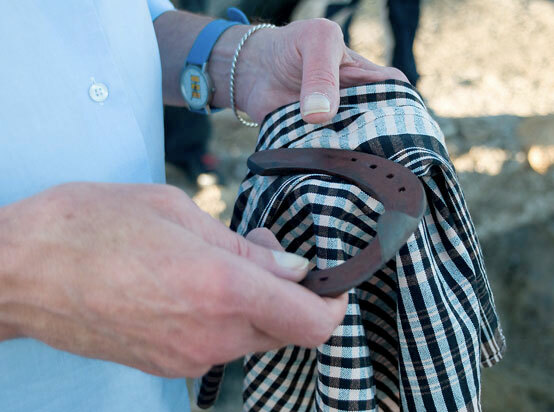 The last element of the project manifested itself as an event realized by the sea during the opening week of the exhibition: an iron horseshoe was wrapped in a cotton cloth and was tossed upon a wave’s crest. 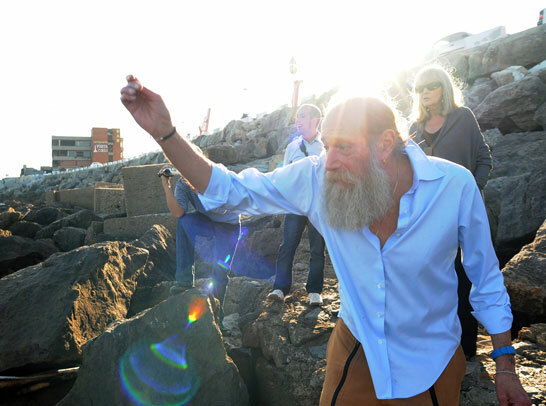 Lawrence Weiner has been a key figure in the development of Conceptual art from the late 1960s to the present. Weiner investigates forms of display and distribution that challenge traditional assumptions about the nature of the art object. Weiner describes himself as a sculptor whose medium is language, and his work is a manifestation of language itself: ‘statements’ that describe sculptural gestures, ideas or actions which are usually articulated in capital lettering printed on walls, but which have also been realised in a range of supports, from books, films and songs to T-shirts, tattoos, manhole covers and posters. These statements conjure up a range of actions from the very general, such as A TRANSLATION FROM ONE LANGUAGE TO ANOTHER to the more specific, e.g. MANY COLOURED OBJECTS PLACED SIDE BY SIDE TO FORM A ROW OF MANY COLOURED OBJECTS. Lawrence Weiner was born in the Bronx, New York, in 1942. After graduating from high school, he traveled across the country working in a variety of jobs—on an oil tanker, on docks and unloading railroad cars. In 1960 in California, he used dynamite to create his 'Cratering Piece' in Mill Valley. His first one-person show was held at the Seth Siegelaub Gallery, New York, in 1964. In 1968 he presented Statements, a small 64-page book composed of texts describing projects, and since then he continued exploring the formal and representational capacities of language as a sculpture. He has had solo shows at Kunstmuseum Wolfsburg (2000), the Walker Art Center, Minneapolis (1994), and the Hirshhorn Museum and Sculpture Garden, Smithsonian Institution, Washington, D.C. (1990). In 2007–8 the Whitney Museum (2007) and the Los Angeles Museum of Contemporary Art (2008) hosted the retrospective 'Lawrence Weiner: As Far As The Eye Can See'. In Spain, his work has been shown at 'Forever And A Day' at the Centro Arte Contemporáneo de Málaga (CAC Málaga). In Barcelona his work has been seen in: 'Between the Pyrenees and the Mediterranean Sea', Fundació Espai Poblenou (1995); 'Interfunktionen 1968-1975', Fundació Joan Miró (2004) and ‘Public Space / Two Audiences: Works and Documents from the Herbert Collection’, MACBA (2006). Weiner lives between New York and Amsterdam. Special thanks to Bethany Izard, Alice Zimmerman, Pierre-Jean Moulis; TOJAY; Roger Soler-Pont and bang! bang! 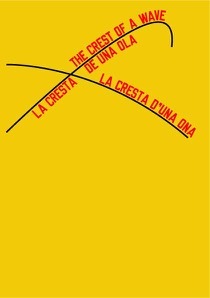 El nuevo proyecto de Lawrence Weiner ‘LA CRESTA DE UNA OLA’ se estructuró en cuatro partes – como una escultura efímera, una instalación, una pieza musical y una acción. Cada parte pretende cuestionar qué constituye o define hoy una escultura pública. La nueva obra de Weiner reveló una crónica mercantil y marítima, ecuestre y comercial española entorno a la biografía de los materiales y la transmutación del lenguaje. El 24 de Septiembre 2008, coincidiendo con las fiestas de la Mercè, la patrona de Barcelona, se distribuyó una escultura efímera en más de 70 emblemáticos bares, restaurantes y cafés de Barcelona, un dulce regalo para acompañar nuestros cafés con leche, cortados o carajillos y la tertulia. Impreso sobre miles de sobres estándar de 7 gramos de azúcar en tres idiomas, la llamativa y reconocible tipografía de la declaración (statement) UN PAÑO DE ALGODÓN ENVUELTO ALREDEDOR DE UNA HERRADURA DE HIERRO LANZADO CONTRA LA CRESTA DE UNA OLA, era acompañada de un emblema en forma de diagrama que evoca la trayectoria de una determinada herradura sobre una ola. La segunda y tercera parte se expusieron en el Nivell Zero de la Fundació Suñol, donde Weiner presentó una adaptación de la declaración sobre una pared del patio exterior en catalán, español e inglés. El último elemento del proyecto se manifestó como un evento, realizado en el mar durante la semana de inauguración de la exposición: una herradura de hierro se envolvió en un paño de algodón y se lanzó sobre la cresta de una ola. 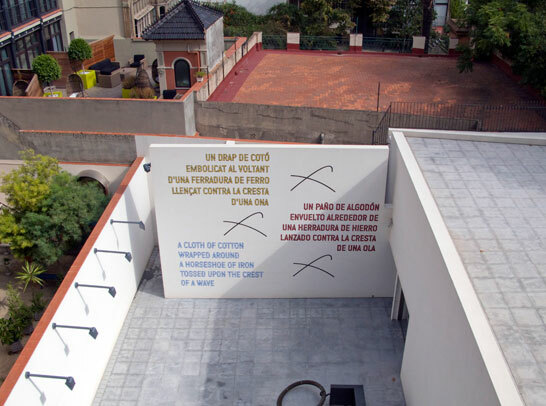 Lawrence Weiner ha sido una de las figuras clave en el desarrollo del llamado Arte Conceptual desde los 60 hasta hoy. Weiner investiga modos de presentación y distribución que retan las hipótesis tradicionales sobre la naturaleza del objeto artístico. Weiner se describe como un escultor cuyo medio es el lenguaje: su obra es una manifestación del lenguaje y se presenta como ‘statements’ (declaraciones) que describen gestos esculturales, ideas o acciones que usualmente se articulan en letras mayúsculas impresas sobre pared, pero que también se han manifestado en soportes tan variados como libros, filmes y música así como en camisetas, tattoos, tapas de alcantarillas y posters. Sus ‘statements’ conjuran una serie de acciones que van de lo general (UNA TRADUCCIÓN DE UNA LENGUA A OTRA) a lo más específico (MUCHOS OBJETOS DE COLORES COLOCADOS UNO AL LADO DEL OTRO PARA FORMAR UNA HILERA DE MUCHOS OBJETOS DE COLORES). Lawrence Weiner nació en el Bronx, Nueva York, en 1942. Después de graduarse en el instituto, viajó a través de los Estados Unidos hasta California donde en 1960 realizaría sus famosas 'Cratering Piece' en el Mill Valley con dinamita. Su primera exposición individual fue en la legendaria Seth Siegelaub Gallery, New York en 1964. En su siguiente exposición en la misma galería presentó sus 'Statements' (1968), un libro de obra compuesta únicamente de lenguaje y desde entonces ha continuado explorando las capacidades y la presentación del legnuage como medio escultural. Weiner ha realizado muestras individuales en el Kunstmuseum Wolfsburg (2000), el Walker Art Center, Minneapolis (1994), en el Hirshhorn Museum and Sculpture Garden, Smithsonian Institution, Washington, D.C. (1990). En 2007–8 el Whitney Museum (2007) y el Los Angeles Museum of Contemporary Art (2008) exhibieron la retrospectiva 'Lawrence Weiner: As Far As The Eye Can See'. En España, su obra ha podido verse en la individul 'Forever And A Day' en el Centro Arte Contemporáneo de Málaga (CAC Málaga) y en Barcelona en las exposiciones: 'Entre los Pirineos y el Mar Mediterráneo', Fundació Espai Poblenou (1995); ‘Interfunktionen 1968-1975', Fundació Joan Miró (2004) y 'Espacio público / Dos audiencias: Obras y documentos de la Colección Herbert', Museu d'Art Contemporani de Barcelona (2006). Agradecemos especialmente la colaboración de Bethany Izard, Alice Zimmerman, Pierre-Jean Moulis; TOJAY; Roger Soler-Pont y bang! bang! Special thanks for their collaboration and generosity in this project to Bethany Izard, Alice Zimmerman, all the team at Fundació Suñol and Pierre-Jean Moulis; TOJAY; Roger Soler-Pont and bang! bang! Agradecimientos especiales por su colaboración y generosidad en este proyecto a: Bethany Izard, Alice Zimmerman, todo el equipo en Fundació Suñol y Pierre-Jean Moulis; TOJAY; Roger Soler-Pont y a bang! bang! Lawrence Weiner was born in the Bronx, New York, in 1942. After graduating from high school, he traveled across the country working in a variety of jobs—on an oil tanker, on docks and unloading railroad cars. In 1960 in California, he used dynamite to create his 'Cratering Piece' in Mill Valley. His first one-person show was held at the Seth Siegelaub Gallery, New York, in 1964. In 1968 he presented Statements, a small 64-page book composed of texts describing projects, and since then he continued exploring the formal and representational capacities of language as a sculpture. The museums in which Weiner has had solo exhibitions have included the Kunstmuseum Wolfsburg (2000), the Walker Art Center, Minneapolis (1994), and the Hirshhorn Museum and Sculpture Garden, Smithsonian Institution, Washington, D.C. (1990). In 2007–8 the Whitney Museum (2007) and the Los Angeles Museum of Contemporary Art (2008) hosted the major retrospective 'Lawrence Weiner: As Far As The Eye Can See'. In Spain, his work can be seen until the 26 October in the solo show Forever And A Day at the Centro Arte Contemporáneo de Málaga (CAC Málaga). In Barcelona his work has been seen in: Between the Pyrenees and the Mediterranean Sea, Fundació Espai Poblenou (1995); Interfunktionen 1968-1975, Fundació Joan Miró (2004) and ‘Public Space / Two Audiences: Works and Documents from the Herbert Collection’, MACBA (2006). Weiner lives between New York and Amsterdam. Lawrence Weiner nació en el Bronx, Nueva York, en 1942. Después de graduarse en el instituto, viajó a través de los Estados Unidos hasta California donde en 1960 realizaría sus famosas 'Cratering Piece' en el Mill Valley con dinamita. Su primera exposición individual fue en la legendaria Seth Siegelaub Gallery, New York en 1964. En su siguiente exposición en la misma galería presentó sus Statements (1968), un libro de obra compuesta únicamente de lenguaje y desde entonces ha continuado explorando las capacidades y la presentación del legnuage como medio escultural. Weiner ha obtenido muestras individuales en Kunstmuseum Wolfsburg (2000), el Walker Art Center, Minneapolis (1994), en el Hirshhorn Museum and Sculpture Garden, Smithsonian Institution, Washington, D.C. (1990). En 2007–8 el Whitney Museum (2007) y el Los Angeles Museum of Contemporary Art (2008) exhibieron la retrospectiva 'Lawrence Weiner: As Far As The Eye Can See'. En España, su obra puede verse hasta el 26 de Octubre en la exposición individual Forever And A Day en el Centro Arte Contemporáneo de Málaga (CAC Málaga). En Barcelona, su obra se ha incluido en las exposiciones: 'Entre los Pirineos y el Mar Mediterráneo', Fundació Espai Poblenou (1995); ‘Interfunktionen 1968-1975', Fundació Joan Miró (2004) y 'Espacio público / Dos audiencias: Obras y documentos de la Colección Herbert', Museu d'Art Contemporani de Barcelona (2006). Actualmente vive entre New York y Amsterdam.